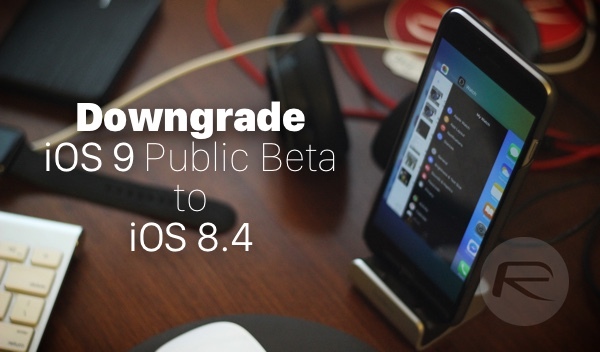 Here’s a step by step guide on how to downgrade iOS 9 Public Beta back to iOS 8.4 on your iPhone, iPad or iPod touch. There are a number of reasons why you would want to do this. First and foremost is because iOS 9 is still a beta and months away from final release. It may still have bugs, performance issues, battery draining problem etc. And secondly, it is of course not jailbreakable. So whether you want to go back to iOS 8.4 for stability or jailbreak, you can because it’s the latest public release and obviously still being signed by Apple. Note: This guide applies to both Public Beta release and developer Beta builds of iOS 9. Step 1: Get the iOS 8.4 firmware file specific to your device. You can download it from here: Download iOS 8.4 Final IPSW Links For iPhone And iPad. Step 2: Download and install iTunes 12.2 on your PC or Mac. You can grab it from: apple.com/itunes. Step 3: Turn off Find My iPhone on your device: Settings > iCloud > Find My iPhone. Step 4: Launch iTunes and connect your device to a PC or Mac using the supplied USB cable. Step 5: Enter DFU mode: Press and hold the Home/Touch ID and Power buttons on your device together. After approximately ten seconds release the Power button but continue holding the Home/Touch ID button until iTunes provides a popup informing you that a device has been discovered in Recovery Mode. Step 6: Now click on the ‘Restore iPhone’ button while holding down the ‘Option’ key if you’re on a Mac, or the left ‘Shift’ key if you’re on Windows. Step 7: When prompted, point iTunes to iOS 8.4 firmware file you downloaded in step 1 for the downgrade/Restore process to start. Now sit back, exercise some patience and wait for iTunes and the Apple authentication servers to work their combined magic. The end result will be a fully restored iPhone, iPad or iPod touch running stable iOS 8.4. Anyone tryout the public beta? It’s somehow stable compared to the iOS 7 betas. I got two reboots after one day of use. Animations also stutter. Some 3rd party apps still don’t work properly. I have no problems so far using it on iPad Mini. Ive downgraded from ios 9 public beta to 8.4 following these instructions.. al went well but the feedback icon is still there? any way to get rid of it? It has some Cool features, like a “Back Option” when using Stock Apps (Mail,Safari,Phone and Messages). I like the new look of Multitasking too. But, it’s missing Proactive Search, Connecting to web is slow, there is a lag on key presses on Pop-Up Notifications and some of My Favorite Apps are acting Funky. I can wait a couple months for the “ironed-out” version. Going back to 8.4. And Mail is Buggy!! Go to Settings>General>Profile, and delete the iOS 9 Public Beta profile. I guess it can help you get rid of it, at least that’s how i got rid of it. Why are there so many authors who pad their articles and disrespect their audiences with time-wasting tripe like this? Anybody still doesnt know how to սոⅼοсking AT&T devices PERMANENTLY??? Its easy at all Go google just google atttiphoneeuunlocking, 6 days is we have to ՍΝᏞΟᏟΚing any device!